Recorded with producer/engineer Waldemar Soychta at Waldstreet Sound in Dortmund, Germany, The Raging Tides is a deliberate and violent thrash attack that stays true to the band's 30 year legacy. Conceptually and lyrically, vocalist Mem V. Stein has based the bulk of the record around human suffering - specifically "caused by torture or other means for political, religious, or personal gain for the individuals/organizations who inflict the pain," Stein asserts. Inspired by a wide range of books and articles, the title of the album itself, according to Stein, "represents the ebb and flow of human misery and despair around the globe." 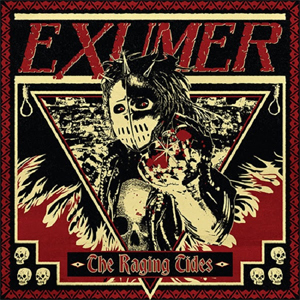 EXUMER also recently announced more dates for their Road Rage 2016 tour. A complete list of currently confirmed dates can be found below.